I have been fascinated by the use of animals as symbols in art for many years. Decoding paintings can be very satisfying. In this painting of the temptation in the Garden of Eden, we have many animal witnesses who, although beautiful, are not just there for decoration. The meanings associated with these animals have been passed down from the Medieval Bestiaries in which animals, both real and mythological, were described, and also ascribed a religious meaning based on their often spuriously attributed behaviour. The lion is an interesting example. Lion cubs were said to be born dead, but after their father breathed on them for three days, they would come to life. Therefore the lion became a symbol of Jesus and his resurrection. The lamb nearby refers to the sacrifice of Jesus and the promise in the book of Isaiah, that in the new heaven and new earth, prey and predator will live in harmony. Even the little partridges at the bottom of the painting have a particular meaning, as a symbol of deceit. The stork and the crane look on, symbols of vigilance, advising the viewer not to fall for the Devil’s tricks, while the stag, the dominant animal of the painting, is quietly gazing into the water, accompanied by a hind and two fawns. The stag’s pose most likely refers to the very popular Psalm 42 “As the deer pants for streams of water, so my soul pants for you, O God.” The message is obvious, stop hungering after the fleshy apples, they will only lead to trouble. But there are more than pious messages in this picture. The placing of the stag’s antlers, their suggestive prongs and the main action cannot be separated. This is a religious painting, but also a courtly painting. Lucas Cranach spent some of his early years in the employ of the Dukes of Saxony, following them on hunts and sketching them running the deer or sticking the boar. The stag is also a symbol of virility, and counteracts the rather weak portrayal of Adam above, who looks dazed and confused by the offer of the fruit of knowledge. Eve, on the other hand, needs no such help. She is strongly connected with the snake in the tree (symbol of evil and the Devil), who is gazing down at her. The way Eve is grasping the branch, her sideways look and especially her hair, curling in imitation of the snake’s coils above, relate her directly with the tempting serpent. The viewer is in no doubt who is at fault in this Creation Myth. I have always liked snakes. To me they seem magical and fascinating. 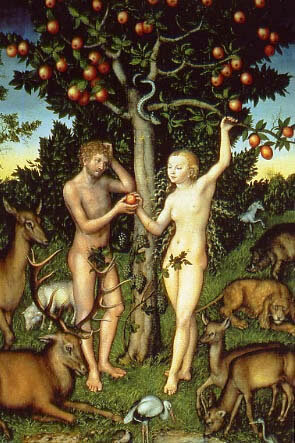 After the temptation in the Garden of Eden, God was said to curse them to go on their belly and eat dust. This has made me wonder: what did the writer of Genesis imagine the serpent was like before this time? How did they move? Did they have legs? Snakes are so different from us, dynamic, and, in some cases, dangerous, that it is not surprising they have accrued dark meanings. We are afraid of that which we do not understand. Even when I came to write my own Creation Myth, I could not help but cast the serpent as the bad guy, responsible for bringing evil to the world. great beings lived, one of each kind. searching for something to fill his emptiness. hiding in the same drift of a small galaxy. After aeons, they gave in to their desires. Their egg was full of water and mud. as hordes of their offspring formed inside. bigger than anything he had eaten before, it continued to grow. The Serpent’s iridescent scales began to creak. in spite of the pain as he distended. one that shone in the starlight, and moved in the depths. His scales heaved up, like waves on a rough sea. His seeping eyes erupted with fiery blood. body fluid, breath bubbles, bones and ash. sometimes sheathed in rainbow, sometimes wreathed in smoke.